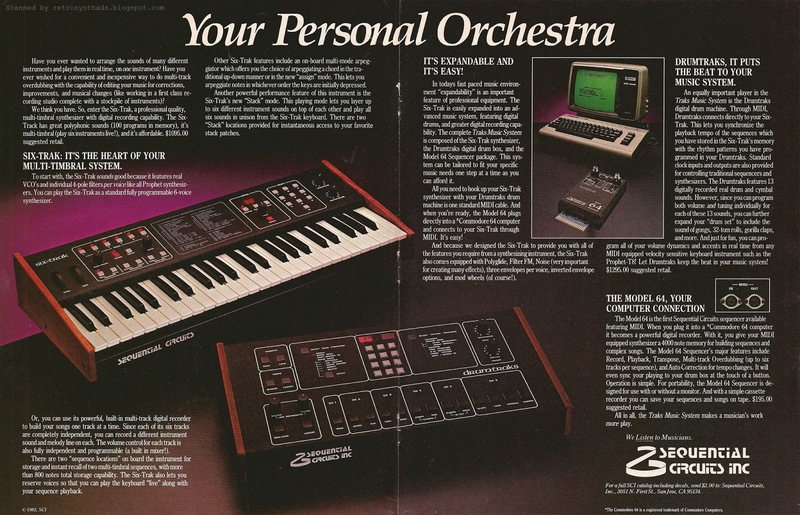 Sequential Circuits Inc. Model 610 Six-Trak, Model 400 Drumtraks and Model 64 sequencer "Your Personal Orchestra" 2-page full colour advertisement from pages 50 and 51 in the February 1984 issue of Keyboard Magazine. The Sequential Six-Trak (with a hyphen) and DrumTraks (without a hyphen) are both pieces of kit that played a huge role in the early music I was creating in the 90s. By that time, their prices had plummeted to all-time lows and could be found in pawn shops and on the used instruments shelves in my local synth shop. And I snatched up both as soon as I came across them. I was already familiar with multi-timbral instruments thanks to my Casio CZ5000 and Yamaha TX81Z, but it was that purchase of my Six-Trak that really helped me learn subtractive synthesis. Even through that wee little programming display panel it was relatively easy to come up with deep bleepy analogue sounds. This two-page centerfold ad received a four-month run from February to May 1984. And was totally worth every inch of ad-space. 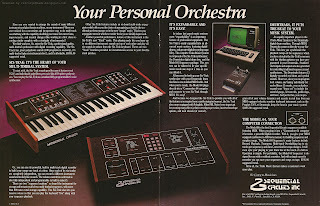 Sequential Circuits was really pushing the "Traks Music System" during this time period, a system "tailored to fit your specific music needs one step at a time as you can afford it". The layout of the ad itself is a feat of ingenious design - even with two pages to work with, the designer had to fit a wack of ad-copy around two feature-sized instruments as well as two smaller images. All while keeping the font size large enough for old people like myself from putting on their reading glasses. The ad-copy for the Model 64 gets a little lost from the photo of the computer and interface, but I can live with that. As good as the layout is, the ad-copy is even better. From the introductory questions that would be right at home coming out of a fast-talking host of a two-minute television gadget commercial, through the flow of text covering each piece of gear, the reader can actually take away a fair bit of information. In particular, I love the section on the Six-Trak - the name drop of the more famous Prophet synthesizers right at the beginning, as well as the focus on it's features such as the sequencer, arpeggiator and stack mode (my favorite mode!). But what I absolutely love best best best, is the fact they included retail prices. And with that, the fact that the Drumtraks drum machine was actually $200 more expensive than the Six-trak synthesizer. $1,295.00 compared to $1,095.00. A great example of the price musicians paid for "digitally recorded real drums" in 1984. Ouch. The Model 64 sequencer, which I blogged about early last week in it's featured ad, had already ended its ad-run by the time this ad appeared, but the little sequencer box got a bit of an extra push because it also got a Spec Sheet promo in this February issue. It's really interesting to look at from an historical perspective to see just how much we take sequencing technology for granted now. Back then, the tech was so new that this Spec Sheet promo became a lot longer just so it could all be explained properly. Truly amazing. "SCI MIDI sequencer. the Model 64 MIDI sequencer is a cartridge that plugs into the memory expansion port of a Commodore 64 personal computer, taking advantage of that system's portability, memory capacity, cassette or disk storage, and video interface. The unit records whatever is played by storing the MIDI information sent from any MIDI-equipped instrument compatible with the rev 1.0 MIDI spec. Up to 400 notes can be recorded. The unit also stores velocity, pitch-bend, and modulation information if the synthesizer is so equipped. For playback, the sequencer sends MIDI information back to the synthesizer either as recorded in real-time or as auto-corrected for subtle timing errors. The playback tempo can be varied by using either the internal clock or an external clock from some device like a drum machine. The sequencer memory can be allocated to 8 independent variable-length sequences, each of which can have 5 tracks for over-dubbing. These are 8 timing error-correct values. Lowest resolution is a quarter note; highest is a sixty-fourth-note. A sequence can be transposed over a 6-octave range. A library of songs can be built by chaining sequences together and storing them on disk or cassette. The unit can be operated with or without a video monitor. LEDs on the cartridge identify up to four sequences and indicate record, play, overdub, and storage functions. Price is $195.00 for the cartridge and manual. Sequential Circuits, 3051 N. First St., San Jose, CA 95134." Best thing I learned from this spec sheet - that you could actually use the sequencer WITHOUT a video monitor. I'm not too sure how easy that would have been - but just the fact that Keyboard made the point of including that in the Spec Sheet is bonkers-crazy cool! I'll leave you with a cool video of the Model 64 sequencer controlling Moog's Animoog synth. Nice.